Discussion and Conclusion: Most adverse events are immediate and mild such as headache, fever and nausea although more serious immediate reactions such as anaphylaxis may rarely occur. Delayed complications are rare but may be serious, including thromboembolic events and acute kidney injury, and these and associated risk factors are also discussed. We emphasise the importance of safe IVIg administration and highlight practical measures to minimise complications of this therapy. 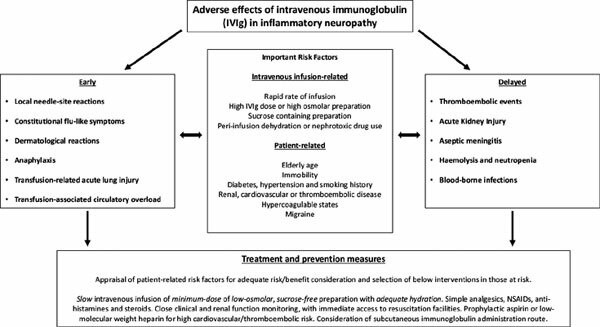 Adverse event, immunoglobulin, inflammatory neuropathy, IVIg, safety, GBS, CIDP, MMN.